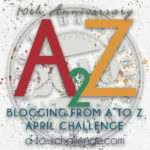 This is the 21st post in the February Photo Collage Festival and the Family History Writing Challenge. 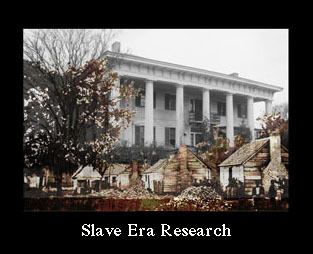 Today I will write about Minnie Averitte Reed Mullins who was my grandmother Pearl’s older sister. 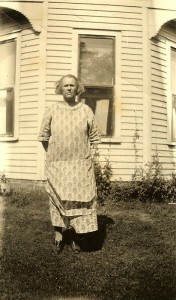 Minnie Averitte Reed was born in Lebanon, Kentucky in 1878. She was the second child of Buford Avritt and Anna Allen Reed and Anna’s 6th child. Anna and Buford were never married and couldn’t have been even if both were willing as Buford was white and Anna was black. Two year old Minnie first appears in the 1880 census living with her mother and five older siblings in Lebanon Kentucky. Her mother’s parents lived next door. By 1893 Anna Reed was in Indianapolis, Indiana. Minnie was 15. Her two older sisters had already married and moved to Berrien County, Michigan. In 1898, when Minnie was twenty years old, she married James Mullins. By 1900 they had one daughter, Helen who was a year old. Everyone in the household was identified as “B” for black. James was working as a fireman. At that time the Indianapolis Fire Department with all the black fireman operating out of the firehouse at 441 Indiana Avenue. By 1910, there were 6 more children. James was born in 1900. Ben was born in 1901. Arthur was born in 1904. Pearl was born in 1906. The twins, Anna and Marie, were born in 1908 and Minnie was born in 1910. The family was still living in Indianapolis and James Mullins had continued working as a fireman. Everybody was identified as “Mulatto”. By 1920 the family had moved to Detroit, Michigan. 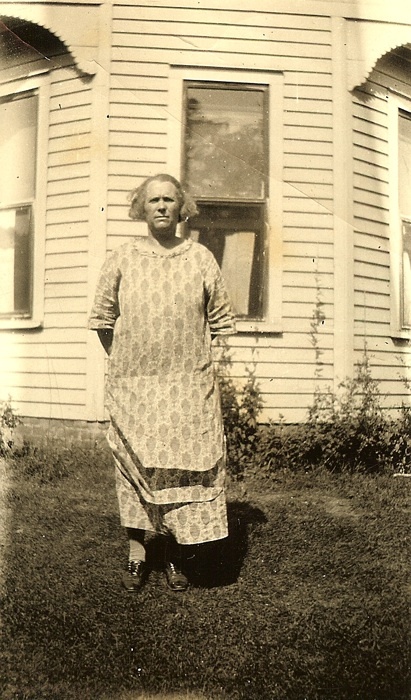 My grandmother Pearl Reed Cleage, Minnie’s younger sister, and her family lived in Detroit. Three more children had been added to the family. William was born in 1913, Harold was born in 1914 and Barbara Louise was born in 1916. James was working as a carpenter at an auto plant. Arthur was working at the Packer Auto Plant. The two oldest boys were around 20 and no longer living in the home. In 1930 Minnie and her family had moved to Benton Harbor, Michigan where her two older sisters and their families lived. 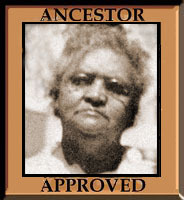 Minnie was identified as ‘white’ while the rest of the family was identified as “Indian”, specifically “Cherokee”. James was working as common laborer. Son Arthur, who works at a foundry and is “Cherokee” and his wife were living down the street as was sister Louise Reed Shoemaker. Youngest son, John was 9 years old. You can read about the Mullins family in 1940 here 1940, Minnie and James Mullins. They were back in Detroit and only three of the sons were still at home. Minnie died in Minneapolis, Minnesota of pneumonia in 1963. She was 84 years old. It’s interesting how the identified ethnicity differed in the census over time. 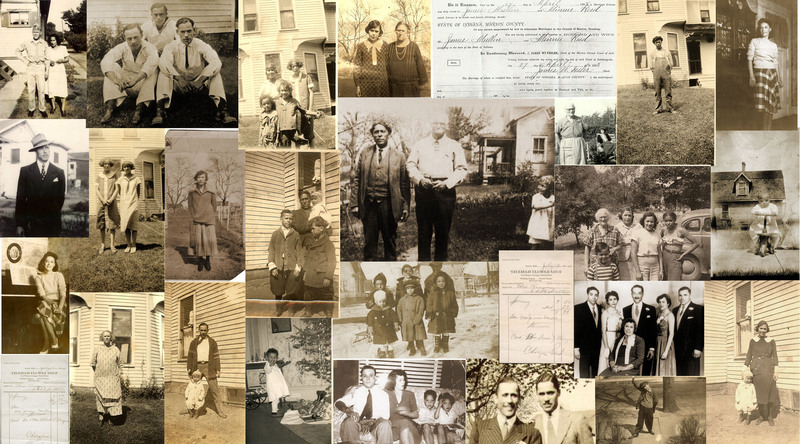 I wonder if different census takers decided which ethnicity to select–or if the family members described themselves in different ways across the years. I think it was a mix of the two. I forgot to say that on her death certificate, her daughter put “white” for race. Kristin – I always love reading your posts. I also really like the idea of studying siblings stories. I feel I haven’t done this enough in my family history but it looks to be very rewarding and enlightening. I guess I always study the whole family. Maybe because I’m just curious. I have heard it’s a good technique but I did it before that. I like the way you have included the family chart with photographs Kristin. I’ll have to try that, its very effective in a blog post. Sometimes family relationships are so complicated I think a chart is the only way to understand them. Who is the couple in the upper left of the foto-collage? Who is that man in the military uniform and the young lady w/ him? Just curious. Just wondering, are you related to me? That is Arthur Mullins Jr., son of Arthur and Hazel Mullins. The woman is his Aunt, “Little” Minnie Mullins.